For the second time on Capitol Hill, staffers, lawmakers and citizens gathered in the Rayburn foyer, removed their shoes, donned orange head scarves and participated in a centuries-old Sikh tradition. The second "Langar on the Hill" recently drew roughly 350 people for the tradition centered around equality, in which attendees sit on the floor and share a meal regardless of racial or socioeconomic barriers. Attendees covered their heads with orange scarves and removed their shoes, reflecting practices for entering a Sikh temple, also known as a gurdwara. The July 28 event followed last year&apos;s first-ever langar on campus. But this year, the racially motivated attack on black churchgoers in Charleston, S.C., weighed heavily on the minds of some participants. Many in attendance drew parallels between the shooting and the 2012 attack on a Sikh temple in Wisconsin. "As we reacted to those events in Charleston, we heard from many of you who identified because of experience that you have had in this regard," Rep. James E. Clyburn, D-S.C., told the crowd. "So I decided to come by today to thank you for standing in solidarity with us. And to let you know that as we move forward as a nation, we hope to do so practicing in earnest that motto for this great nation: e pluribus unum, out of many, one." In 2012, a gunman opened fire at a Sikh temple in Oak Creek, Wis., killing six people. The worshippers were preparing for langar, the very tradition Hill staffers and lawmakers engaged in last week. Rep. Paul D. Ryan, R-Wis., who represents Oak Creek, spoke at the event with more than a dozen other members from both parties. The chatty crowd quieted for his remarks, and continued to eat the traditional Indian dishes. "As you know, Oak Creek was the site of just bottomless evil and violence," Ryan said. "But it was also a site where a community came together. It was also a site where the Sikh community displayed just incredible warmth, incredible generosity." Ryan applauded the members of the Sikh community working to combat religious discrimination. "We have more work to do to clear those barriers, to accept everybody, to make sure no one is discriminated against, and to make sure everyone is tolerated and included, especially these fantastic leaders who are pillars of our community that we are so proud to call our friends and our neighbors in Oak Creek, Wisconsin,” Ryan said. After his speech Ryan told CQ Roll Call he thought this type of event was "fantastic" and said it would help "increase relations and improve understanding of the Sikh community." Langar attendees crowded around Ryan after his remarks, many snapping pictures and taking selfies with the Wisconsin Republican. 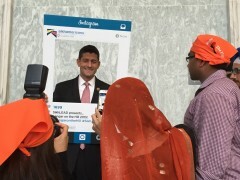 Ryan also obliged organizers by taking a picture with the Instagram cutout they had on hand. The cutout reflected an increased social media presence at the event, which used the #langaronthehill hashtag. Encouraging social media interaction was among the goals of the 10 student interns who organized the event. The interns all participate in the SikhLEAD internship program, which is part of the Sikh American Legal Defense and Education Fund, or SALDEF, a group that raises awareness and advocates on behalf of the Sikh-American community. "When we started our internships this summer a lot of folks were asking us if we were going to do it again this year," said Kiman Kaur, a University of Utah student interning at the National Organization of Women. Kaur said they were able to use last year&apos;s framework and further enhance their outreach to raise more funds and bring more members to the event. Six of the 10 interns have positions on Capitol Hill. Shawn Bhatia, a University of Houston student interning for Rep. Ted Poe, R-Texas, praised his internship as an incredible learning experience, and said people are mostly curious about the outward expressions of his faith, such as his turban and beard. Poe also spoke at the event, and pointed to a letter members of Congress sent to the Army, imploring the military to allow Sikhs to serve and still be able to observe their faith by wearing turbans and keeping their beards. On July 30, more than three dozen members also pushed for religious freedom in sports. The lawmakers penned a letter to the International Basketball Federation asking the group to change its policy and allow Sikhs to wear turbans in competition. A number of the lawmakers who signed the letter spoke at the langar. For the interns who organized the event, having lawmakers and staffers attend the langar to learn more about their faith is the first step toward combating discrimination against Sikhs, which spiked after the Sept. 11 terrorist attacks. According to SALDEF, there are roughly 700,000 Americans who practice the monotheistic religion, which is the fifth largest in the world. But SALDEF researchers found more than 70 percent of Americans cannot correctly identify a picture of a Sikh man wearing a turban as Sikh. “Whether the class next year decides to do this or not, I think we definitely created an awareness here," Kaur said. "People will remember this and remember our faces. And it think that’s important for us — for people to not be like, &apos;Oh I’ve only seen one turban my whole life,&apos; but, &apos;I’ve seen a whole room full, and I’ve shared this tradition with them.&apos;"